When you're driving up the coast from Daytona Beach, the first thing you will see as you approach historic St. Augustine is the lighthouse. Stop here and the climb 219 steps inside the lighthouse. It's windy at the top, but you'll see great views of the ocean and the City of St. Augustine. You can join the lighthouse museum, or simply pay a nominal fee in the gift shop to get into the lighthouse and the lighthouse keeper's house, which is now a museum. 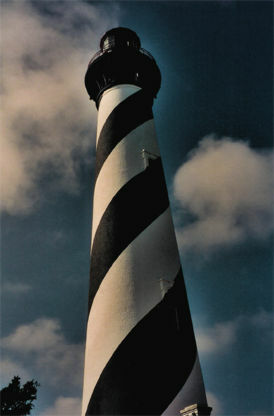 Visit the lighthouse on the Internet at StAugustineLightHouse.com. 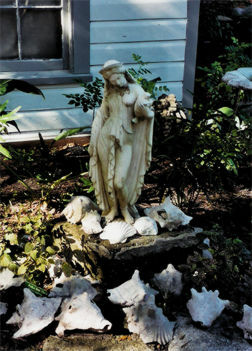 St. Augustine is the oldest settlement in America, with a history going back to the late 1400s, when Ponce de Leon came there and discovered the Fountain of Youth. 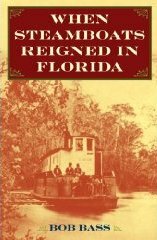 There's also a rich history from the late 1800s, when Henry M. Flagler used his great fortune to build or buy hotels and establish a railroad in Florida to attract tourists. He had three big hotels in St. Augustine facing each other on the corner of King and Cordova Streets. Here are the three buildings as they look today. Only one is still a hotel. 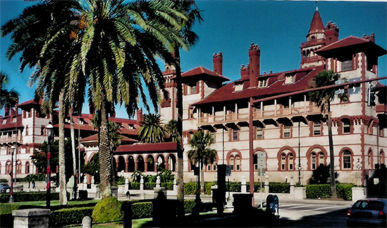 The former Ponce del Leon Hotel (above) is now Flagler College (Flagler.edu). 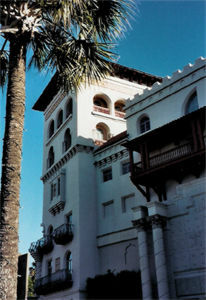 The former Hotel Alcazar (below, left) is now the Lightner Museum (LightnerMuseum.org). The old Cordova Hotel (below, right) is now the Casa Monica Hotel (CasaMonica.com). 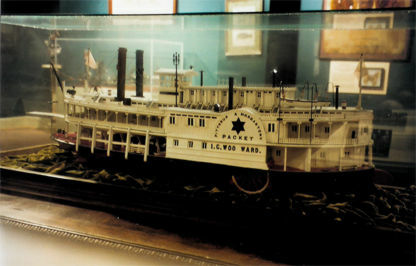 Inside the Lightner Museum I found a steamboat under glass. There's a lot more to see. Be sure to find the old pool, a cement room that was once the largest indoor swimming pool in the world (LightnerMuseum.org). If you leave the Lightner Museum and walk two blocks south on King Street you will come to Old St. Augustine Village. It's a city block of nine historic houses built between 1790 and 1910. Each house contains a collection of period antiques. This is well worth seeing and supporting (Old-StAug-Village.com). There are many beautiful patios and planted areas surrounding the houses. Our docent told us to feel free to grab a rake and help clean up after the storm. I still regret letting that opportunity go! This is one of the best sites in St. Augustine and worthy of spending a few extra hours after the short guided tour. Above: A peaceful garden patio in Old St. Augustine Village. Below: I captured some steamboats on film, as seen in a painting hanging on the wall inside one of the houses in Old St. Augustine Village. If you're looking for a ride on a paddle wheeler, St. Augustine is the right place to go. 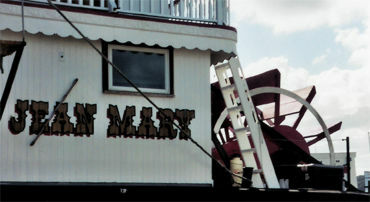 Ancient City Riverboats has the place covered with their beautiful sternwheelers Jean Mary, the Anastasia, and coming soon, Sara Grace. 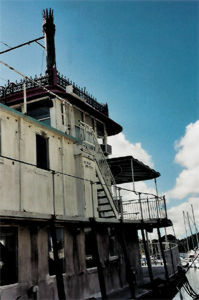 You can find them in St. Augustine at Oyster Bay Harbor, which is in the bramble behind the southeast corner of King Street and Ponce de Leon Boulevard, or here on the Internet: AncientCityRiverboats.com. Not to be confused with Ancient City Travel, a local St. Augustine local travel agency on Highway 1. If you get hungry for some good organic food, you can find healthy sandwiches at the lunch bar of A New Dawn Natural Foods store (lunch bar open until 3 p.m.), just across the bridge from St. Augustine on Anastasia Island. You can also get a good vegan meal at the Manatee Cafe, just north of town on State Road 16. Oyster Bay is also home to an old ghost boat in transition. I heard this boat used to operate in St. Augustine, but is on its way to New York State. 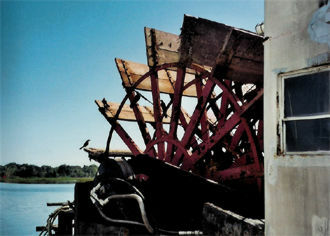 Right now its paddlewheel is a crows' perch. While in St. Augustine, Florida, I saw the ghost of Catalina de Porras. She is a famous ghost who lived in the 1700s. The house she haunted had burned down in 1887 when fire swept the town, but was rebuilt. Catalina's house is now a Harry's Seafood Bar & Grille, and a big group of us had dinner there. They seated us around a large table upstairs, near the women's powder room where Catalina is often detected. Toward the end of the evening, a few of us went to the powder room to see if we could find her, then we went back to the table. Within a couple minutes, I noticed a lighted and transparent female figure dressed in 1770s-era clothing pull a chair up to the table, seating herself between me and the woman to my left. The vision only lasted a second, and then I felt cold and had to go home. Nobody believed me that I had seen Catalina. In 1763, the British gained control of St. Augustine, forcing ten-year-old Catalina's Spanish family to leave their home along Matanzas Bay and move to Cuba. Twenty years later Spain regained control. 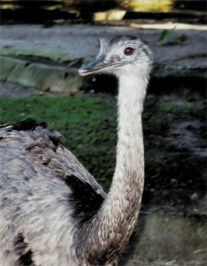 A grown-up Catalina returned with her husband and petitioned the government for possession of the family's home. She was successful, but died just six years later, giving her little time to enjoy the old home place. In 1887, the house burned when a devastating fire swept through St. Augustine's bay area. It was rebuilt soon afterwards to resemble the original structure. In recent years, Catalina's home has housed a series of restaurants. Former owners and employees have become accustomed to seeing the fleeting glimpse of a young woman dressed in white, passing by them on the second floor or appearing as a reflection in a mirror. She comes and goes, and no one is sure exactly who she is, but many believe it's Catalina, who has decided she won't be driven from her home again. This was one great opportunity for NEFLPI to investigate one of the most notoriously haunted locations in Northeast Florida. If anyone spends time doing paranormal investigations in the area, they are sure to hear reports of personal experiences at Harry's. Many a patron has gone to the restrooms on the second floor and experienced the presence of the ghostly inhabitants. The history of the location dates back to the early 1700s during the original Spanish occupation of St. Augustine. In these early days, the building was owned by the de Porras family who's daughter Catalina would play a key role in future ghost stories. 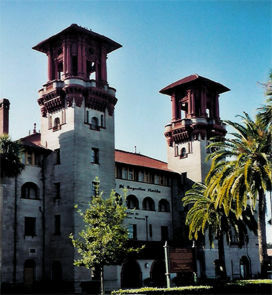 The de Porras family owned the building until the 1760s at which time the control of St. Augustine changed hands to the British. The family moved to Cuba and lived there for a number of years at which time the building remained vacant. In 1784, control of St. Augustine again changed back to Spain and many of the Spanish moved back. The de Porras daughter, Catalina, and her husband negotiated with the governor to regain ownership in 1789. Catalina loved the home since her childhood but sadly she died a few years after coming home. It is believed that Catalina's spirit is still present. In 1887 a fire swept thru the bay front of St. Augustine and burned the home to the ground. A replica of the structure was built in 1888 based on the original and thru the years it has been a boarding house, apartments and restaurants. Of the restaurants operating in the building, from 1993 to 1997 it operated, as Catalina's to recognize one of its more memorable owners. In 1997 the name was changed to Harry's, which it remains today. The history is interesting but what about the haunted guests? Many of the stories focus around a woman being seen or heard on the second floor, specifically in the ladies restroom. Some believe this inhabitant to be ghost of Catalina herself staying on in the home that she so loved. Another possibility is the spirit of a woman named Bridgette, that it is rumored to have died on the second floor during the fire of 1887. Many of the employees and patrons have reported personal experiences that vary from seeing a woman in white to smelling perfume. One of the current owners told us that they would bring in fresh flowers on a regular basis and that would seem to make the ghost happy. On the night of the investigation, we met late due to the working hours of the business. We had access to the entire building, which included two floors of the restaurant and a third that had offices and storage. We set up IR cameras on all three floors with one in the notorious second floor ladies restroom. We performed our preliminary sweeps for EMF levels and temperatures and noted areas with high levels. 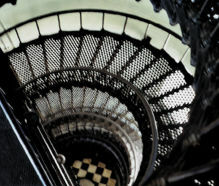 We broke into groups with Dee and Sandy heading up to the second floor to begin with an EVP session in the ladies restroom. John joined them and used the handheld camcorder for documenting evidence. We would change up teams throughout the night investigating all three floors. Not much was noticed as far as personal experiences until later in the night. While Tammy and Heather were in the second floor ladies restroom, one of the lights unexplainably turned on while doing an EVP session. This was interesting since we had unscrewed the bulbs in the room since we could not find the light switch. This may have been a case where the bulb was just at the point of making a connection or maybe it had some unseen help. Another personal experience happened at the end of the night when John and Sandy were also in the ladies restroom. Sandy felt something playing with her hair and expressed the feelings on video. The most interesting thing is that a couple of minutes later, we caught two unexplained light orbs at the same spot. Review of the audio and video recordings has resulted in some interesting finds. We caught some unexplained lights and several Class A EVPs. We are happy that Harry's turned out to live up to its reputation for paranormal activity. We appreciated the chance to investigate Harry's and the staff could not have been more gracious. If you're traveling the St. Augustine, do yourself a favor and stop by for some of their great food or to have a drink. Harry's is located in the midst of the historical area and very convenient. While you are there, make sure to visit the second floor bathrooms and see if you can have your own ghostly experience. 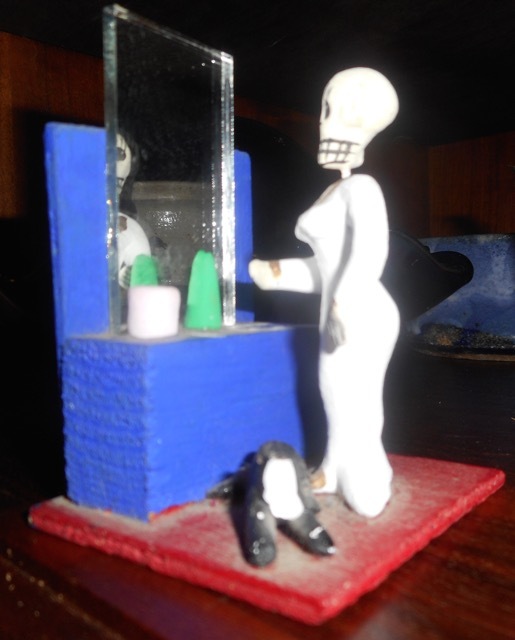 In 2014, I found this 3-1/2" statue in a pottery shop in Guadalupe, Arizona. I bought it because it reminded me of Catalina de Porras, and I love it. And now, finally, a stop at Ponce de Leon's Fountain of Youth. This is a must-see. The gardens are beautiful and you get a big dose of history, along with a drink from the famed fountain. The grounds have many peacocks. Here's one that is at least three hundred years old. He looks good for his age, probably because he drinks the water.